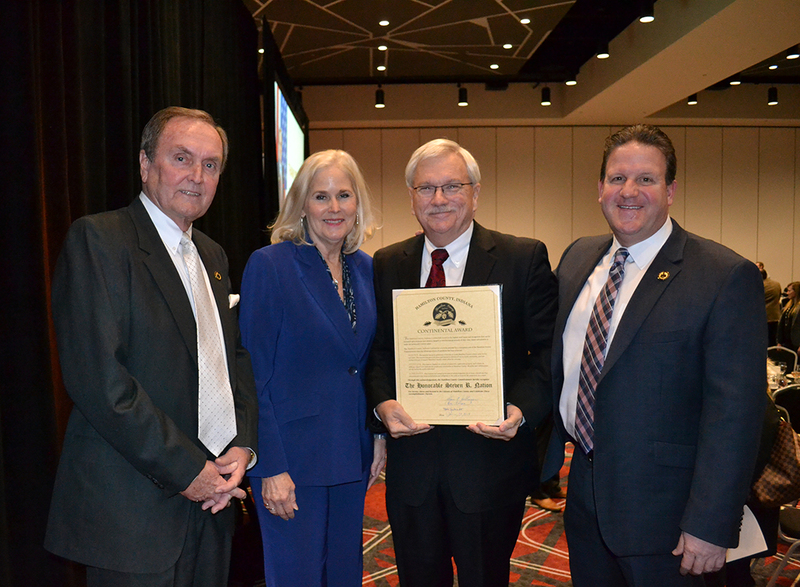 During the Jan. 23 State of the County address, given by Hamilton County Commissioner Steve Dillinger, the Hamilton County Continental Award was presented to retired Judge Steve Nation. The award is the highest honor that can be bestowed on Hamilton County residents. In addition to presenting the Continental Award, the commissioners also christened a new county trail that runs from Noblesville through Cicero, Arcadia and Atlanta. It is called the Steve R. Nation Nature Trail. Nation was elected to the bench in 1995. Prior to that, he served as the Hamilton County Prosecutor for four terms. Nation has always been involved in the community, from coaching youth football to chairing funding drives for the Hamilton County United Way to serving as a board member for the Hamilton County Red Cross and Noblesville Boys & Girls Club. Nation continues to be highly involved in the Hamilton County Youth Assistance Program, which he helped create. The program is designed to help at-risk students stay in school and out of the juvenile justice system. Nation’s last day on the bench was Dec. 30, 2018.